John George Weidner. Courtesy of Die St. Mariengemeinde zu Buffalo Grove, Illinois via Raupp Memorial Museum, Buffalo Grove, Illinois. [S11] John J. Weidner, Compiled Birth, Death, 571, 600, 629, 664, 684, 687. [S7] St. Mary Catholic Church, St. Mary's School Dedication, 136, 146. [S11] John J. Weidner, Compiled Birth, Death, 701 no date. 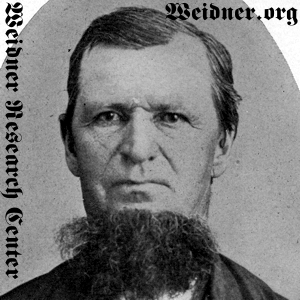 [S11] John J. Weidner, Compiled Birth, Death, 545 German state only, 629 birth year only; 629 state birth date as 22 May 1833 as extrapolated from age at time of death 81 yr, 6 mo, 17 da. [S427] Andrew P. Weidner, State of Illinois; Department of Public Health - Division of Vital Statistics; Certificate of Death, Birth country only. [S536] 05 Jul 1860 1860 U. S. Census, Arlington Heights, Cook County, Illinois, USA, Wheeling Township, page 151, dwelling 1062, family 1023, 1860 census states he is 27 years old and born in Bavaria, written as "Bayinn." [S1037] John M. Weidner, State of Illinois; Department of Public Health - Division of Vital Statistics; Standard Certificate of Death, Incorrectly states his birth as Buffalo Grove, Illinois. [S8] Edwin Weidner, The Weidner History, 8, death year only. [S11] John J. Weidner, Compiled Birth, Death, 629 full date. [S37] Cook County Herald, 27 Nov 1914, p. 8, col. 5. [S11] John J. Weidner, Compiled Birth, Death, 629. [S536] 05 Jul 1860 1860 U. S. Census, Arlington Heights, Cook County, Illinois, USA, Wheeling Township, page 151, dwelling 1062, family 1023. [S896] Unknown author, Church Records, 1853-1915, St. Mary Catholic Church, Buffalo Grove, Illinois, Film Number 1548218, Items 22-25, St. Mary, Buffalo Grove, Baptism 1855-1901, N.I., page 4. [S1037] John M. Weidner, State of Illinois; Department of Public Health - Division of Vital Statistics; Standard Certificate of Death. [S11] John J. Weidner, Compiled Birth, Death, 600. [S11] John J. Weidner, Compiled Birth, Death, 622. [S11] John J. Weidner, Compiled Birth, Death, 545. [S427] Andrew P. Weidner, State of Illinois; Department of Public Health - Division of Vital Statistics; Certificate of Death. [S11] John J. Weidner, Compiled Birth, Death, 687. [S405] The Cemetery Committee, Vernon Township Cemetery Inscriptions, Lake County, Illinois, 105. [S11] John J. Weidner, Compiled Birth, Death, 628. [S11] John J. Weidner, Compiled Birth, Death, 571, 684. [S11] John J. Weidner, Compiled Birth, Death, 664. [S11] John J. Weidner, Compiled Birth, Death, 561.